Editor's note: A ceremony will be held on Friday, Nov. 22 to celebrate the Brafferton's renewal. The event, open to the public, will take place at 2:30 p.m. in the Wren Yard. The construction fence is down, and the staff has moved back in. 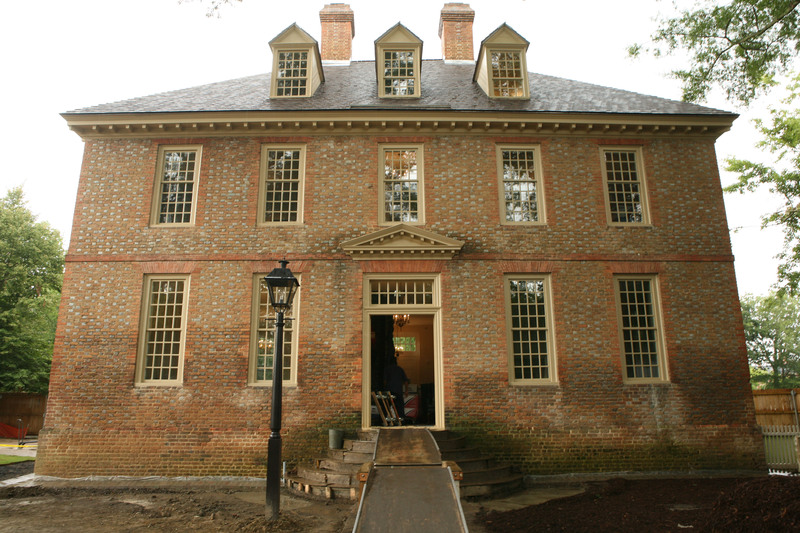 The renewal of William & Mary’s historic Brafferton building is complete. The project began in the summer of 2012 and addressed the preservation as well as the safety needs of the building. The updates are the first major work on the property since it was part of the Colonial Williamsburg restoration in 1932. “It’s marvelous to see this grand old building restored to life after 13 months of restoration and renovation. And it’s reassuring to know that the Brafferton’s skeleton is strong again, ready to stand for generations to come,” said William & Mary President Taylor Reveley. Constructed in 1723, the Brafferton is the second-oldest building on campus. All of its mechanical, electrical and plumbing systems needed to be replaced. The exterior of the Brafferton retains most of its original masonry. Chimneys, foundations, walls and exterior steps all required repair and re-pointing. “We were able to give the building everything it needed thanks to the generosity of our private donors and the Commonwealth,” Reveley said. The $3.65 million project was completed on time and on budget. The Commonwealth of Virginia funded $1.4 million of the project with the remaining capital coming from grants and private donations including $1 million from the Lettie Pate Evans Foundation, a $300,000 challenge grant from The Mary Morton Parsons Foundation and support from William & Mary’s Classes of 1961 and 1962 as part of their 50th Reunion Class Gift Projects. An endowment established by James W. McGlothlin '62, J.D. '64, LL.D. '00 and Frances G. McGlothlin ‘66, and supported with additional estate gifts, will provide for the ongoing preservation of the building. Inside or out, many of the changes aren’t obvious to the average observer. But that is by design, Kale said. Window sashes were repaired and re-glazed, the unfinished pine hardwood floors treated with an invisible fireproofing material and the Brafferton Kitchen, a small outbuilding that features meeting space, is now wheelchair accessible, with re-grading of the sidewalk making a ramp unnecessary. Renovation projects on historic buildings are complex and sensitive undertakings, Kale noted. Now the building is ready for the next century. The Brafferton was originally built with funds from the estate of Robert Boyle, a famous English scientist, and was designed to house the College’s Indian School. At the time of the American Revolution, the College lost the income from the Boyle estate, and the Indian School was discontinued. As part of this project, the Brafferton Legacy Group -- consisting of four Native American alumni – was formed to represent communities with links to the College’s 18th century history. In its later history the Brafferton has served a variety of purposes, including dining hall, faculty residence, dormitory and classroom building. Today the structure hosts offices for the College’s president and provost. The 18th century structure stands adjacent to the Sir Christopher Wren Building (1699) and the President’s House (1732). The three buildings form the most intact surviving colonial campus in the United States. Three archeological digs associated with the project also added to the known history of the building, including the discovery of an artifact-filled Civil War-era cistern. Since 1999 Kale has participated in the renewal of all three of the College’s colonial buildings – the Wren in 1999, the President’s House in 2005 and now the Brafferton. “It’s like finishing a historical and unique trilogy,” she said. For more information visit the project's website.